Welcome to Street Fighter 3 Forever. A fan site for the best 2d fighting game created. We have created a web site for us fans. Here you can find some pictures of our battle zones and videos of our matches. This site was created to keep track of our own progress in mastering the game but also to reach out to others that love the genius that is Street Fighter III. Check out our Links section for some great links to SF3 tutorials. The video section will have our featured battles but for a more comprehensive list of videos check out our youtube channel. Released on May 1999, the third installment of Street Fighter III brought back the classic Street Fighter II character Chun-Li, along with four new characters (Makoto, Remy, Q and Twelve), extending the selectable roster to 20 characters with Akuma now a regular character. All of the returning characters from the previous Street Fighter III games were given new stages, endings and even voice actors, continuing the overall storyline from where the first two games left off. The commands for Air Parries, Throws/Holds and Leap Attacks were changed from 2nd Impact. Additionally, the player can perform a "Guard Parry" or a Parry during a Guard Stun if the timing is right. A "Guard Parry" is also known as a "Red Parry" due to the fact that the character turns red when performing it. The game also introduces a grade-based "Judgement System", in which the winning player in a single or two-player match is graded after the match based on Offense, Defense, Techniques and Extra Points. Special Points are also awarded after fulfilling special requirements. The single player mode consists of ten regular opponents, which includes a character-specific rival as the penultimate opponent and Gill as the final boss for all the characters except for Gill himself, whose final boss is Alex. Despite his status as a regularly selectable character, the CPU version of Q can only be fought in the single-player mode as a secret challenger. The "Parry the Ball" minigame from 2nd Impact returns as well as a new version of the "Crush the Car" minigame from Street Fighter II. 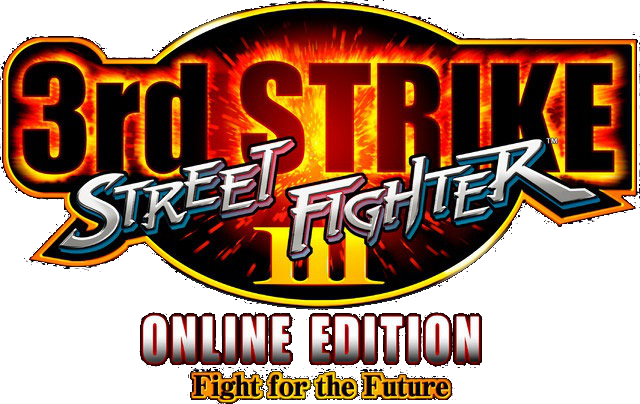 And Now bringing the new generation of World Warriors to new consoles, Street Fighter® III: Third Strike online Edition takes one of the deepest, most sophisticated fighting games of all time online with an arcade perfect re-creation.